JANE’S FAMILY MADE A TRADITION out of spending Sundays together, whether it be at Beulah Beach in Mukwonogo, at a polo game in Milwaukee, or at Krahn’s Bar to watch the Packers play. POSTED October 5, 2018 10:25 a.m.
VIOLA - Sundays were sacred and diverse in the Schmidt family, when I was growing up. We spent many of them at Krahn’s Bar on National Avenue. Dad watched the Packers, drank Pabst Blue Ribbon beer, and smoked Pall Mall straights. Mom chain-smoked and pretended to watch the game. I drank kiddy cocktails and ate chips while rolling balls around the pool table. I don’t remember what Jack and Jill, my much older brother and sister, did, but it wasn’t anything with me. The pool table was off-limits to me and therefore extra fun to play with while Dad and others were busy yelling at the massive TV set behind the bar. I could mess with those striped and solid balls a long time before Dad would notice. Occasionally, a ball would fly off the table, bounce hard, and roll. If it rolled toward the bar, I’d crawl on my hands and knees through ashes and peanut shells, between four steel legs and two human legs, to retrieve it. ‘Kitty’ cocktails, as I thought they were called, were my favorites—not so much the cherry on the green plastic spear, but I did like the pineapple! The pockets in the corners of the pool table provided the perfect place to hide the cherries I never ate. During halftime, the tavern set out hot ham on hard rolls, gooey potato salad, small green pickles, and black olives with holes in them that slid easily over the tips of all my fingers. 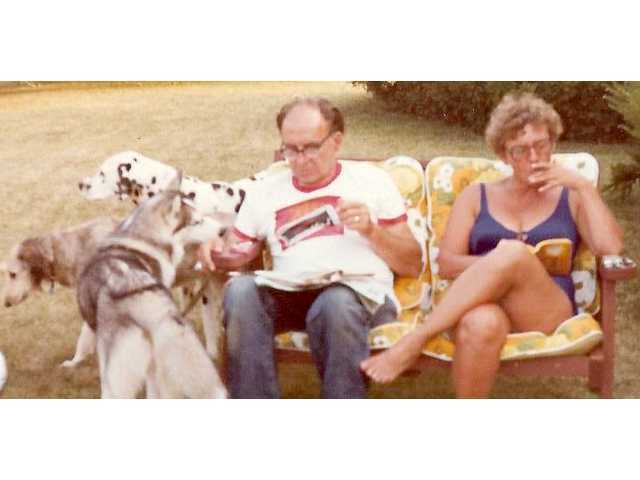 On hot summer Sundays, we’d often load up our green station wagon and head for Beulah Beach in Mukwonago. For a child filled with anticipation, it was a long drive. The car was loaded up with baskets of hard rolls and ham (a Sunday tradition), and a cooler full of Pabst and pop, carrot sticks, plums, and peaches. There were also bags of Corn Curls, Ruffles potato chips, and pretzel rods. Before Mom and Dad could even set down the blanket, Jack, Jill, and I would race into the water. Whoever could run out into the water the farthest without falling down won. The beach leading into the lake was all smooth sand as far as I could touch. It wasn’t until I was on my tippy toes in water up to my neck that I’d feel a few stones sticking out. Farther out there was seaweed, or so said Jack and Jill, who were much taller. The lake was full of heads bobbing up and down, beach balls flying, air mattresses floating, and inflatable plastic turtles with babies in them, being pulled through the water by smiling parents. Mom was a worrywart and was always watching over us, shouting and waving like a lunatic if we went out too far. Eventually, she’d call us in for lunch, followed by the dreaded one-hour wait before we could go back into the water. For years, I thought I’d drown from cramps if I skipped that waiting period. Now, I recognize it for what it was—parent relaxation time. When I was older, we often spent Sundays watching polo games on Good Hope Road in Milwaukee. You could sit in the bleachers or enjoy a picnic alongside the playing field. Mom would bring a huge plaid blanket, the picnic basket, and our old Coleman cooler—more pop and Pabst! Although they’re referred to as ponies, polo horses are full grown, muscular, and sleek. The games moved fast, the ponies glistened with sweat, and the players’ faces were filled with intensity. The field was a whirlwind of pounding hoofs, swinging mallets, and flying balls. You were forced to pay attention and often had to move quickly to avoid being trampled! Dressed in denim pedal pushers and tennis shoes, I would race to the end of the field, hoping to snag a dented wooden ball rolling out of bounds or one that had just scored a point. Jack ran faster though, and usually beat me to it. The games consisted of six periods called chukkers. During halftime, the announcer would invite the crowd out onto the field for the traditional “divot stomp.” We’d run around and push clumps of grass and dirt back into holes caused by mallets striking the ground or a horse’s hoof digging in on a turn. For a while all we could hear was the sound of laughter and the stomp, stomp, stomp of many feet. After the divot stomping, while some of the younger crowd used the field for throwing Frisbees, Dad would take me over to where the players parked their trailers and kept their strings of ponies. He never failed to mention that he and my mom had met while exercising polo ponies. Krahn’s Tavern was sold many moons ago, and Beulah Beach became private when condos were built along the shore. Polo games are still played in Milwaukee but not where we went; that field is now a 7,000-seat indoor soccer stadium. I no longer follow the tradition of Sunday hard rolls and ham, nor do I indulge in Pabst or pop. Now, I spend my sacred Sundays hiking with my pups, brushing the donkeys, or playing with my pet pig. Before work on Monday, chores need to be done, a column written, and clothes washed. Times and habits have changed, but with any luck, my memories will last forever.